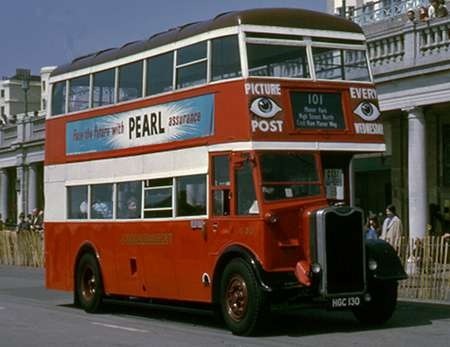 Here we have a Guy Arab II with a Park Royal H56R body, new to London Transport. This vehicle is part of the London Bus Preservation Trust collection, formerly at Cobham but now at Brooklands. Once more, we have a difference of information between Jenkinson and PSVC2012. Jenkinson says it has a UH56R body and dates from 1945, while the PSVC does not mention the utility element and says it dates from 1946. I’m sure that they cannot both be right, unless it was built in 1945 but did not enter service until 1946. Someone out there will know no doubt! It looks like a utility to me,although possibly one of the ‘relaxed’ utility batch judging by the number of opening windows. According to Ken Glazier’s London Bus File, G351 was taken into stock on 5 January 1946. 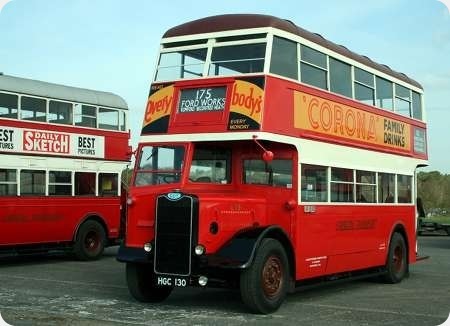 Bodies constructed in 1945 were to relaxed Austerity specification with rounded front and rear domes. 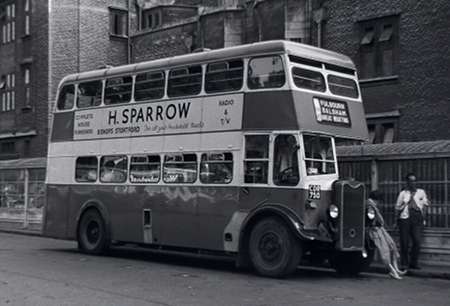 Pete, according to the excellent Ian’s Bus Stop website, many of these Park Royal/NCB Utility-specification buses (G319-G357) didn’t enter service until January/February/March 1946. G351 is documented as entering service in February 1946. There can be little doubt that they were in fact built in late 1945 to wartime specifications, but it depends on which date we prefer to use. I seem to have omitted the location and date when I submitted this to Peter for consideration: Wisley Airfield, on 5 April 2009. The unimpeachable authority on this subject is Ken Blacker’s book ‘London’s Utility Buses’. The final LT consignment of Park Royal H30/26R bodies on Guy Arab II chassis was delivered in two batches. G319 to 357 arrived at Chiswick between 17 November 1945 and 3 March 1946. G351 itself was accepted into stock on 3 January 1946, which certainly means that it was constructed in the last weeks of 1945. G431 to 435, the final batch of these buses and London Transport’s very last utility Guys, were accepted between 18 and 30 March 1946, and probably were built earlier in that year. G319 to 339 retained the old sliding mesh gearbox with ‘back to front’ gear lever positions and the two plate clutch inherited from the pre war Arab model. Those from G340 onwards had the new constant mesh gearbox with conventional selector positions coupled with a single plate clutch, a specification that was carried forward into the postwar Arab III. The Park Royal bodies on these last LPTB Guys made no concessions in appearance whatsoever towards the relaxed utility specifications by then prevailing. Even the stark upper deck front ventilators were retained after Weymann and Northern Counties had abandoned this feature. In fact the only ‘relaxations’ incorporated were tubular framed (cushioned) seats and winding windows. The complete vehicle with its composite construction bodywork weighed 7 tons 5 cwts, compared with 7 tons 6 cwts for the last Weymann bodied London Guy utilities and 7 tons 13 cwts for the excellent metal framed Northern Counties Arabs. All the London Transport Arabs had been withdrawn by December 1952, the newest then being just over six years old, though the indifferent quality of construction materials was evident in bodywork deterioration. 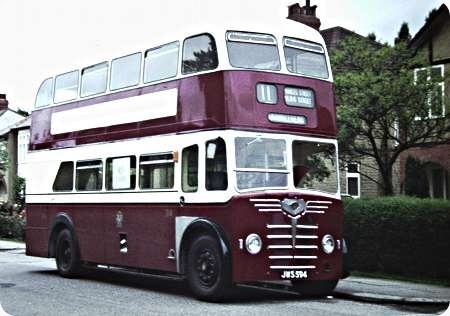 Upon its sale by LT, HGC 130, the former G351, went in 1953 to the very satisfied Guy Arab operator, Burton-on-Trent Corporation who had the bodywork refurbished by Roe. Burton then ran it until withdrawal in 1967, after which it thankfully found its way into preservation. 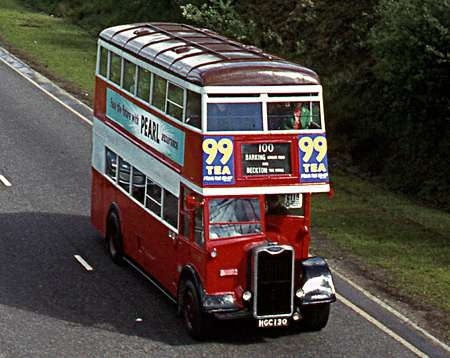 Here are some pictures of this bus taken during the HCVC Brighton runs between 1969 and 1972 by which time some sag in the body waistrail was beginning to become evident. Thank you, gents, for your thoughts on the true date of this bus. Age apart, it is one of the most attractive utilities I have seen, only those from Southdown come anywhere near. It just shows that a good livery can lift even a mundane design. I was the very lucky person who purchased G351, or Burton 70 as it was then, in 1967. I met Reg Stack a former Park Royal employee and he stated that the body was built in October 1945 and it was delivered to London Transport in November 1945, thus to my mind it is a 1945 vehicle but of course some of the ‘anoraks’ would insist that it was a 1946 vehicle. I presently own two Guy Arabs that were first licensed on the 1st January 1956 and again the ‘anoraks’ insist that they are 1956 vehicles. All I can say is that Guy Motors and Park Royal were very clever in constructing two chassis and bodies in one day and delivering to their operator!! !